So we decided to buy a boat, sell Lucky, and sail the seven seas! Just kidding… That would be cool though! 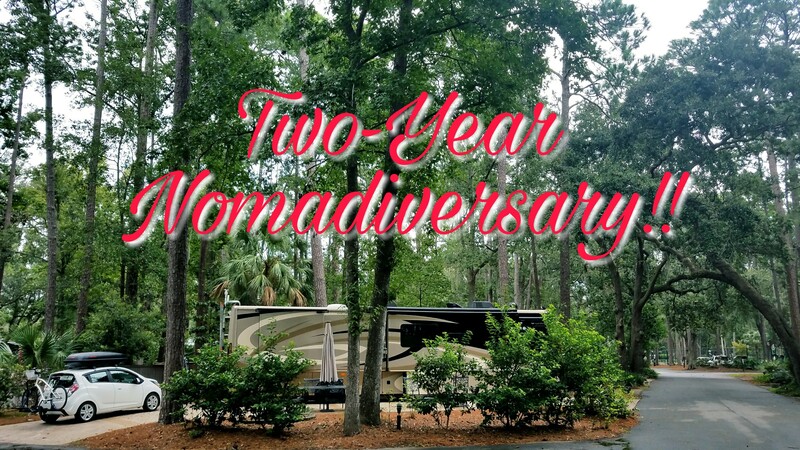 Seriously now, we hit the two-year mark of nomadic existence on the last day of August! It’s definitely been an adventure, but that’s what we signed up for, right?! This past month has been especially crazy, even by full-time RV standards. On August 16th, we departed Ocean Shores, Washington (right on the Pacific Ocean) for a two-day trip to Madras, Oregon. 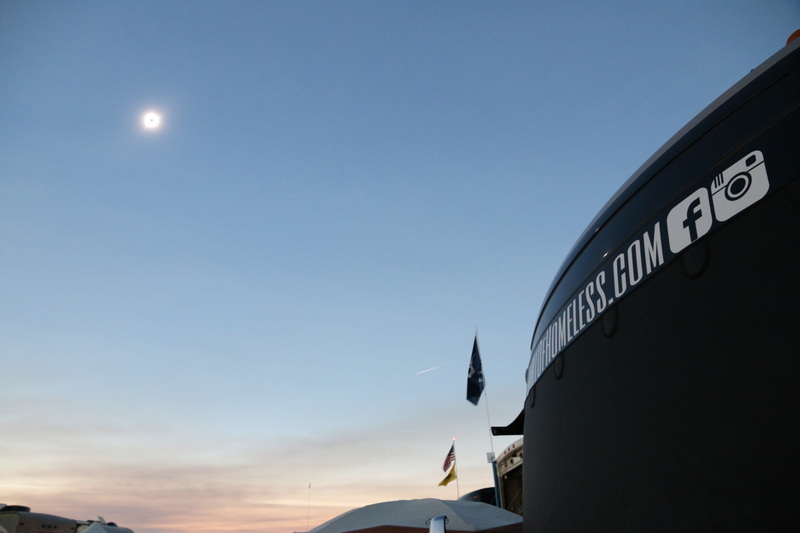 From August 17th through the 22nd, we had an AMAZING time with fellow Xscapers and saw the total solar eclipse the morning of the 21st. From there, we began a very impromptu, unplanned cross-country trip to one of South Carolina’s barrier islands: Hilton Head. Why??? Great question! There’s a good answer, but let’s back up a bit. In the spring of 2016, we visited Hilton Head for a week. We LOVED it! 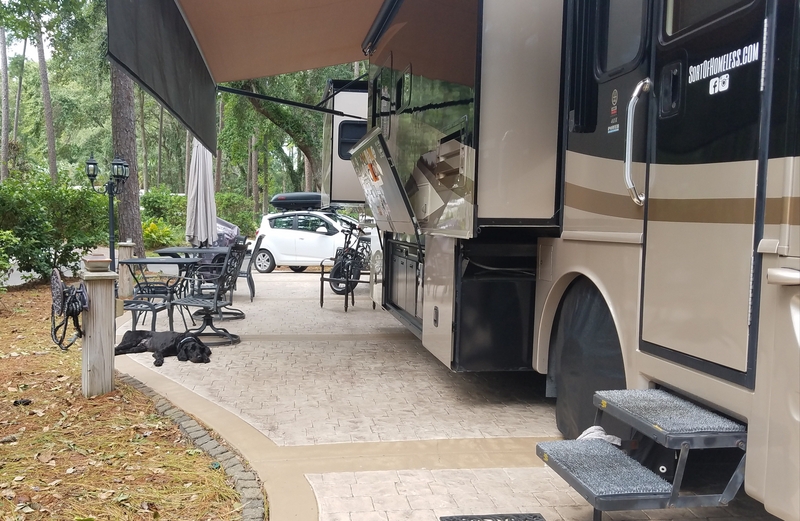 We stayed at the nicest RV Resort (a real resort, not an RV park that just adds that to their name): Hilton Head Island Motorcoach Resort (HHIMR). During our stay we spent time with my family and really enjoyed the vibe and atmosphere of the island. HHIMR is a “condominium style” park where each site is individually owned and when the owners are away, the sites are rented out. Each site is individual and different, within the owner’s covenants. At that time, we walked the grounds looking at sites that were currently for sale, but nothing came of it. Since that visit, we’ve talked a lot about having a “home base”. This could come in various forms, but basically it’s simply a spot we could spend as much, or as little, time at throughout the year. The only issue with having a home base is that it’s in one place – for folks who chose this lifestyle that can be a bit intimidating. We love traveling, seeing new places, meeting new people, but sometimes it’s nice to set the parking brake and know that I won’t be touching it for more than three weeks (which is the longest we’ve been in one place since hitting the road). I thought about buying a plot of land, installing hookups and building a structure to compliment the RV’s living space. This would be awesome, but there are challenges of local ordinances allowing RV living, utility permitting, etc. Then you also have to think about keeping it up when we’re not around – and when we’re there… buying a lawnmower is not on my wishlist. Ok, so now you have the necessary background. Add to those an advertisement we found with a site for sale at HHIMR which fit our budget and you have the recipe for a hasty, potentially life-altering decision. As you likely concluded on your own; we are new lot owners at the Hilton Head Island Motorcoach Resort! One big hangup in making that decision was that we could smell the Pacific Ocean while making it. Our long-term plans were to stay out west for the Fall and Winter, but there was no way that I was going to spend the money and not go enjoy my new purchase. Knowing that Madras, OR was the furthest east we’d be for the foreseeable future, we pulled out of Solartown and pointed Lucky towards the sunrise. Altogether, from Ocean Shores, WA to Hilton Head Island, SC, it was a 3,032 mile cannonball run – if everything goes smoothly. 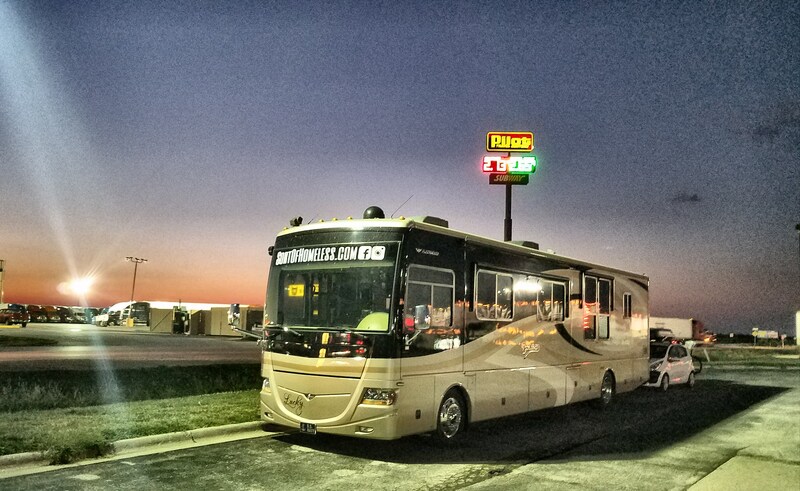 There was no way that a trip that long with an RV and everything we own could go smoothly. Fortunately, most of our issues were outside our control and we just had to roll with the punches. In this case, the punches had names: Harvey and Irma. We were making our way across the country on I-80 when Houston was getting drilled by Hurricane Harvey. While this didn’t directly affect us, there was a lot of moisture being spun-off, affecting a lot of the Tennessee Valley and the Southeast U.S. Obviously, I can drive in the rain, but it’s my strong preference not to do so. It makes a mess of everything and water-intrusion is always a concern for the storage bays – very stressful. So we waited out Harvey at Thousand Trails Natchez Trace and then made it over to the East coast. After being at our new-to-us site for a whole two days, Hurricane Irma – and the SC governor – decided we should go elsewhere. Luckily, we have good friends with a lake house near Greenville, SC and they offered us their driveway as long as we’d like to be there. We weathered the storm there and since their power went out (and still isn’t on at the time of writing this), we slowly made our way through the traffic back to our new home base. Thankfully, Irma shifted it’s track further west than expected and the island was spared from the fury that could have temporarily erased this dot of land in the Atlantic Ocean – and our new investment. So what’s changing? Not much! Our big picture plan is to spend approximately six months a year on Hilton Head (still living in our RV – no sticks and bricks for us! ); three months in the Spring and another three months in the Fall. While we’re not here, the site will be available for rent and cared for by the resort. While away, we plan on continuing to explore this great continent – including heading back to the west coast, soon! We still have Thousand Trails and I’m sure it will continue to be an integral part of our travels. For now, I’m going to spend some time NOT driving. I love traveling, but driving Lucky, with all the attachments, for weeks on end will add some years to this 30-something. We’re putting down some shallow roots and getting all the toys out for this eternity of a stay! We welcome you to come visit us on HHI or to rent the site while we’re away! Either way, safe travels! 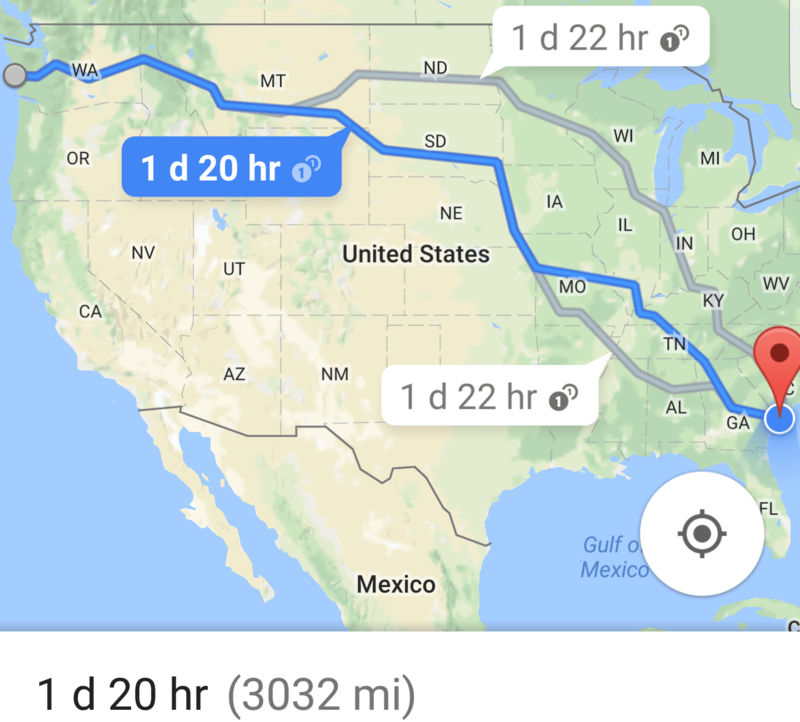 Hey, Congratulations, sounds like a nice place, Ill add it to my list, just curious what was your hours/miles traveled per day during the cannonball run? Hey Bob! 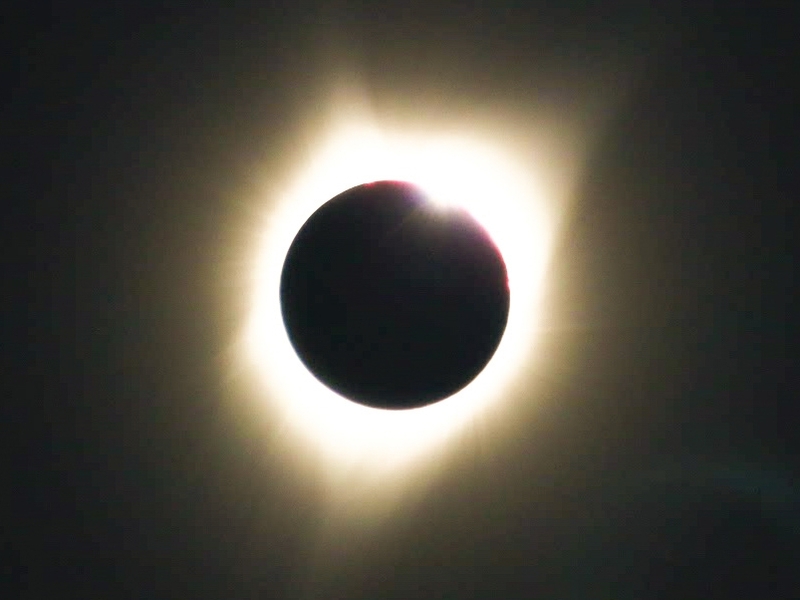 It varied quite a bit from about 180 to nearly 500 miles per day. Some stops were strategically short or long so we could check off some of the states on our map (our rule is to stay at least one night – just driving through doesn’t count) or to get to a more desirable overnight location. We only stayed in an actual campground twice: two nights in Ogden, UT and four nights at Natchez Trace while waiting on weather to clear. Everything else was Walmart, Cracker Barrel, truck stops, roadside attractions, etc. It was a legit cross-country trip! How exciting, Ryan, Kim, and Jet. Good to hear that you are all safe from the ravages of Irma and also the far reaches of Harvey. Congratulations on your new “roots” in SC. We will definitely consider your location when we swing east next spring. Thanks, Char! 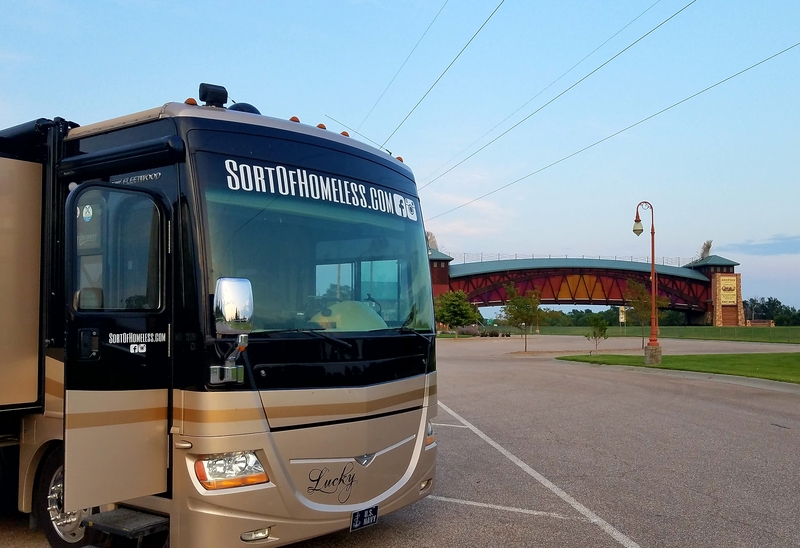 We hope that you’re enjoying your new home on wheels! Congrats on two years and best of luck to you guys with your new “home-away-from-home”. I’ve just added it to our list of destinations for when we hit the east coast at some point. Hope to see you on the road sometime again soon.